Prevent water damage on any weight of porous and textured concrete and masonry with Rust-Oleum® OKON® Plugger Water-Repellant Sealer. 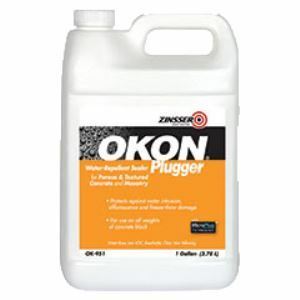 Prevent water damage on any weight of porous and textured concrete and masonry with Rust-Oleum® OKON® Plugger Water-Repellant Sealer. Micro-Plug™ technology plugs surface pores, preventing water absorption. Paintable, recoatable and ready to use. Apply a uniform wet coat with a brush, roller or garden-type sprayer.